Daily Illuminator: Take To The Stars . . . With A Pyramid?! September 27, 2014: Take To The Stars . . . With A Pyramid?! Space -- the infinite frontier. Can't get there from here . . . unless you have a spaceship! 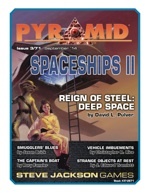 This month's Pyramid is here to help, with Pyramid #3/71: Spaceships II. This jam-packed issue features David L. Pulver's timeline-expanding supplement for the GURPS Reign of Steel setting, looking at a future where the evil AIs have set their sights on a new domain. It includes several new GURPS Spaceships vessels that our robot overlords might use to strike against us -- or perhaps could be captured by heroes to turn the tide. In space, no one can hear you calculate humanity's demise . . . This installment also has an expansion of the ideas from GURPS Power-Ups 1: Imbuements, adding the idea to the realm of vehicles. Whether driving a low-tech wagon or an ultra-tech starship, your craft will dodge, speed, ram, or self-repair like never before! In addition, this month includes four sleeper ships that might unleash excitement and danger to unwary travelers, a look at the art of futuristic smuggling, a new way to give starting GURPS heroes their own spacecraft, and more. Each month, Pyramid explores strange new realms of gaming greatness. Beam this creative cargo aboard individually, or subscribe today and get this issue along with new realms of amazing adventure every month!